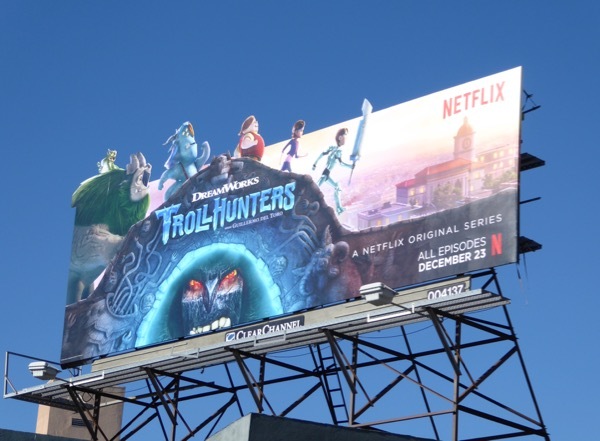 The skies of L.A. have been so busy and the weather so abysmal this New Year, that it's taken some time to share these fun billboards for Netflix and DreamWorks new animated series, Trollhunters. 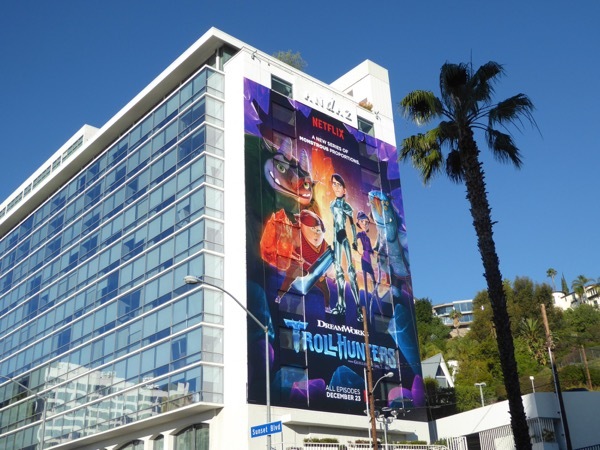 In the computer-animated series based on the fantasy book series by Guillermo del Toro and Daniel Kraus, Anton Yelchin (in one of his final projects before his tragic death) voices the 15-year-old boy who stumbles upon a mystical amulet that transforms him into a mighty warrior and gives him the title of 'Trollhunter'. 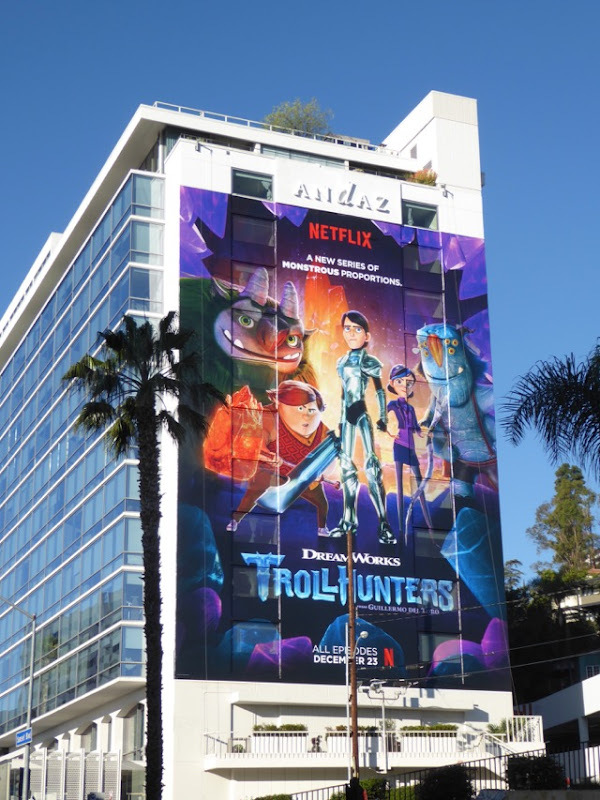 Along with his friends he becomes the protector of a secret civilisation of trolls that reside beneath their hometown of Arcadia, battling ancient evils and monstrous threats, when school allows. 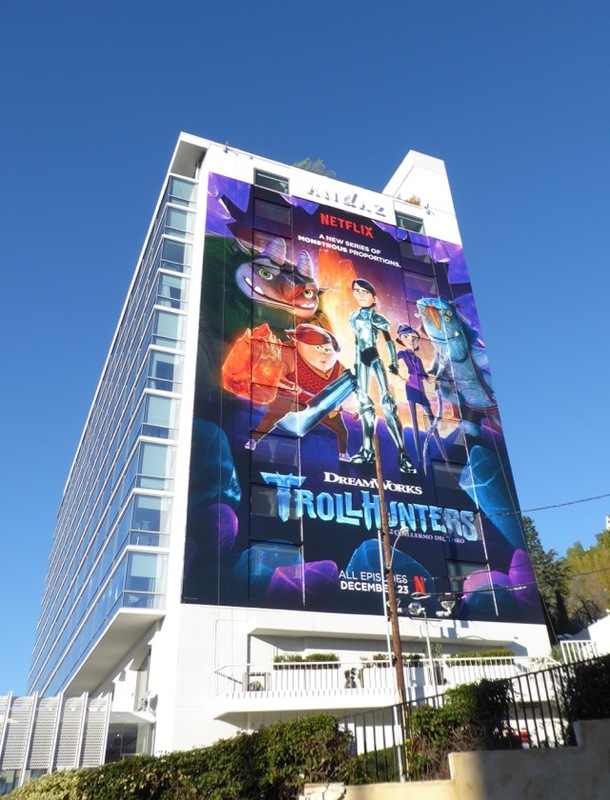 These colourful series launch billboards were photographed on the side of West Hollywood's Andaz Hotel along the Sunset Strip and above Westwood Boulevard on January 14, 2017. 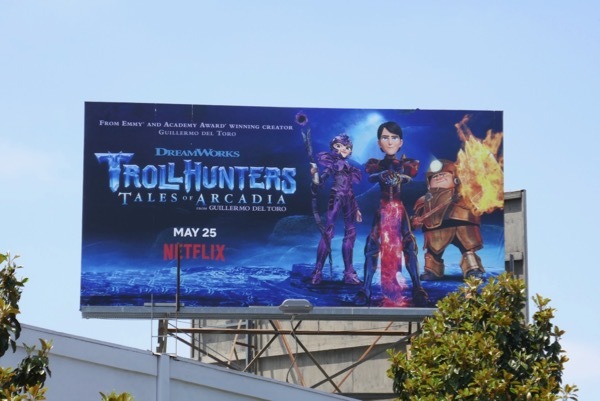 For more projects from Guillermo del Toro, make sure you enjoy these TV billboards for The Strain, these Crimson Peak movie billboards and these Pacific Rim movie billboards. 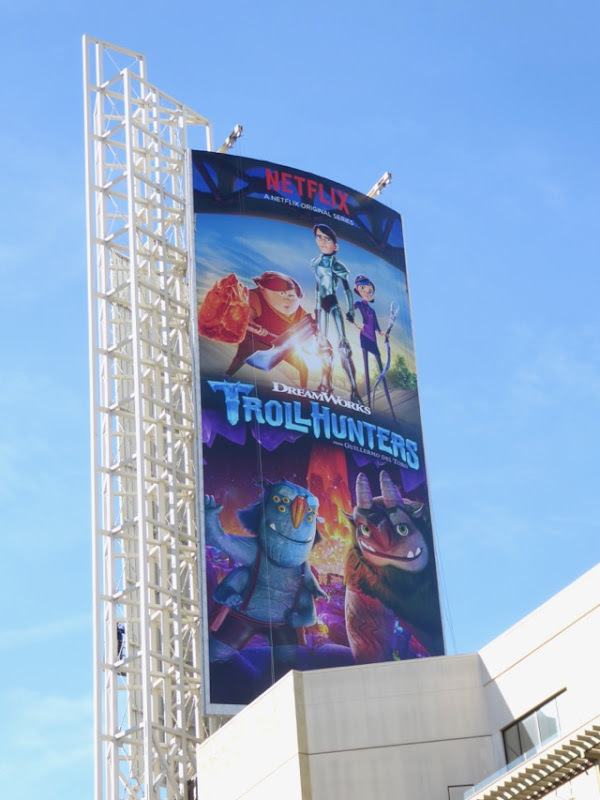 It looks like it's time to suit up and protect humanity and good trolls from the evil trolls that lurk in the darkness. 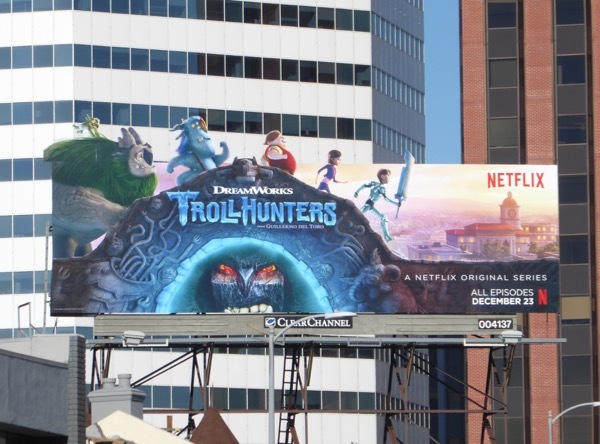 UPDATED: Here's another portrait ad creative for the animated show spied high over Hollywood & Highland during the same time period. 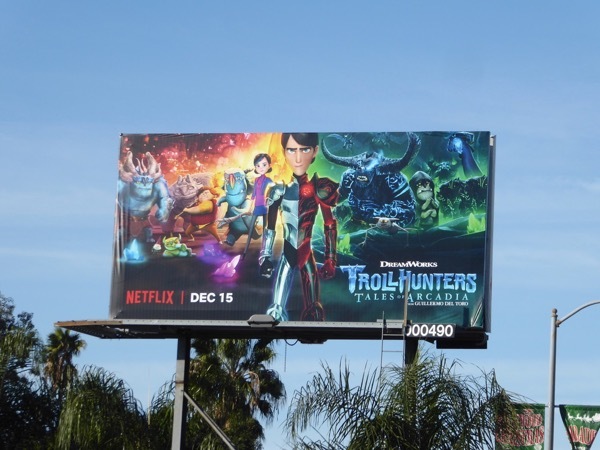 UPDATED: Here's also a sophomore season billboard for the animated series, now subtitled Tales of Arcadia, snapped along Fountain Avenue on December 22, 2017. 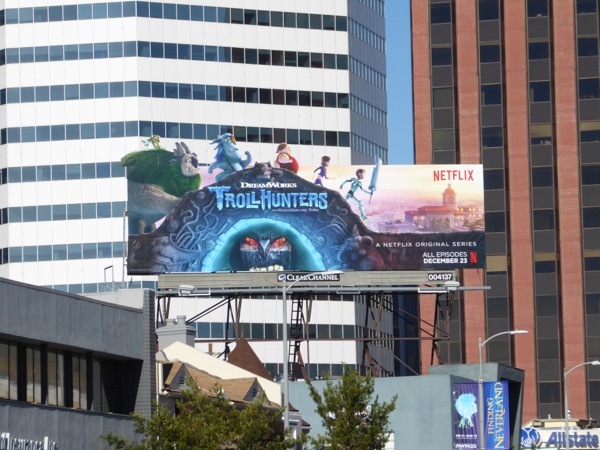 UPDATED: And here's a billboard for the third and final season of Trollhunters, spotted above Beverly Boulevard on May 28, 2018. 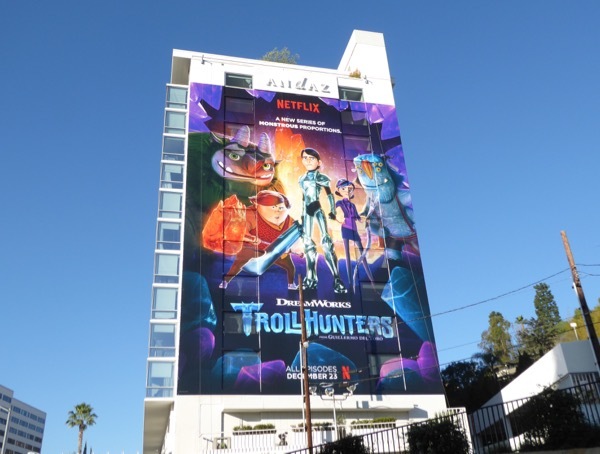 It's time to clobber some evil trolls.